I am doing a research project for my undergraduate thesis (psychology). I would like to program the Iowa Gambling Task (IGT) in OpenSesame. I found a tutorial on scripting the IGT in OpenSesame. The thing is that I want to modify the script in such way that a questionnaire is inserted after a certain number of trials in IGT. The participant is to be redirected to that questionnaire, answer the questions, and resume the task from where he left off. 1. Could I embed a link to that questionnaire (developed in Google forms) in the experiment? For example, let's say I want that after trial 30 in the experiment the participant to be redirected automatically to the webpage of that questionnaire. Is it possible? 2. If 2 is not possible, could I still develop that form in OpenSesame and program the questions to appear in the experiment after a certain number of trials (and the participant to be able to resume doing the task from where he left off, after answering the questions)? And how can I do that? 1) as far as I know that is not possible. That is, you will be able to open a browser with the questionnaire, but I don't think you can get back to experiment. It makes probably more sense to implement the questionnaire in Opensesame with forms. 2) That is certainly possible. You'll need to make clever use of run_if statements and the live_count variables of the loop items. Unfortunately, I can't find information on how to do that. Sorry for not being able to help better. Once you get started, I can try to give you some more directions. Okay, I understand. I will try to develop the questionnaire in OpenSesame. Thank you so much for your help, Eduard, and I will definitely contact you again, should I need further directions. I managed to develop that questionnaire in OpenSesame and embed it in the IGT experiment. The only issue is that the log file is quite messy. This is the questionnaire, it has 26 questions. I put them in this format and the "form_loop" gets repeated after every experimental "loop". 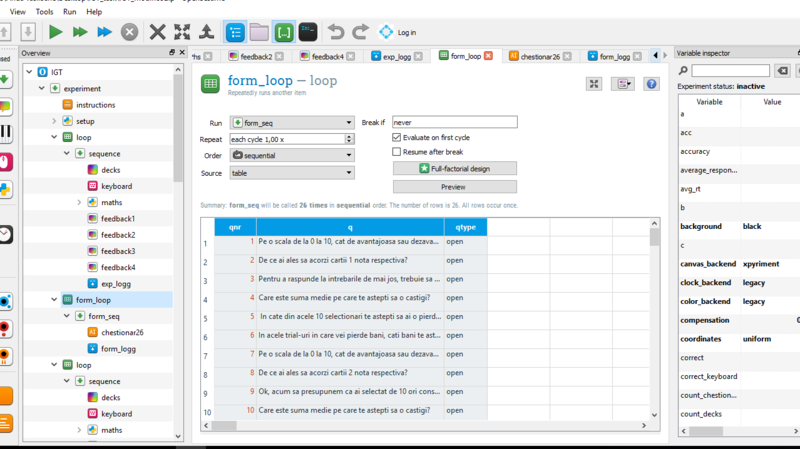 There are 5 experimental loops, so the form_loop gets repeated 5 times. 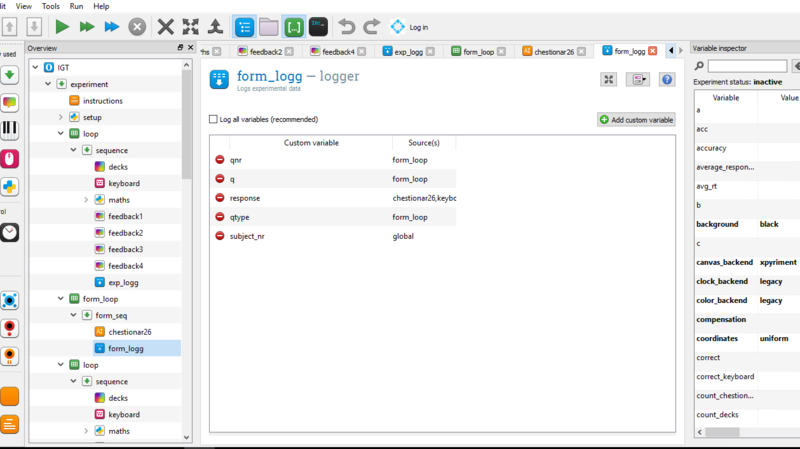 This is the logger of the "form_loop", which I used to save the data from the questionnaire. There is also a separate "exp_logg" logger to save the data from the experiment. These loggers repeat with every "form_loop" and, respectively, experimental loop. I am not at all good at programming at this is the best I could do with the documentation available online. 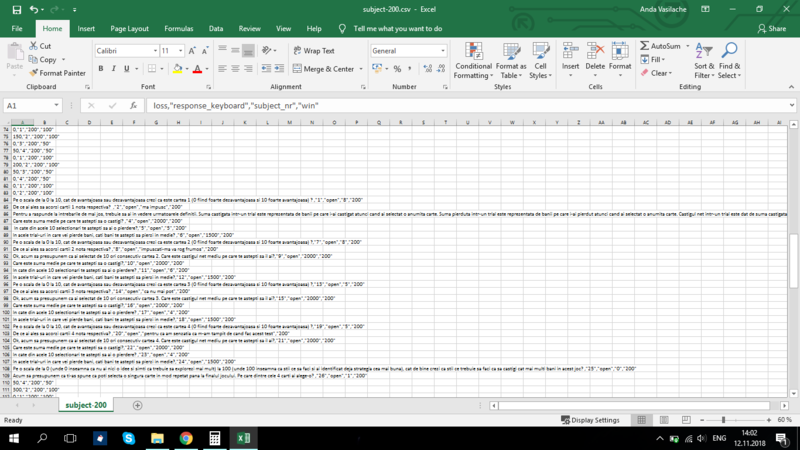 Is there any way that I could embed the questionnaire so that the final log file would not be so messy? How do the log files look like? Can you attach them. Generally, it is advisable to have a single log file and sort out relevant things during postprocessing. At least that is my preferred approach. Have you had a look at this part of the documentation? Like you said, I can sort out myself the answers of the questionnaire and put them in a separate sheet in excel. I think it is the best solution.